Although most folks would like to avoid it, traversing Highway 17 is a necessary hazard as it is the main artery that connects Monterey Bay to the Bay Area. SR 17 carries over sixty thousand commuters every day. Unfortunately, Highway 17 is considered to be one of the most dangerous highways in California. SR 17’s combination of narrow shoulders, dense traffic, sharp turns, blind curves, and sudden changes in traffic speeds have led to driving conditions that result in a number of collisions and fatalities, leading to the reputation of SR 17 as one of the most dangerous highways in the State. The highway is even more dangerous in the winter months, because of combination of wet roadways and drivers’ failure to slow down for the slippery conditions. 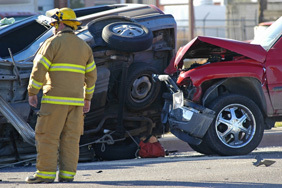 The number of traffic crashes on Highway 17 has skyrocketed in recent years. There were 664 traffic accidents on SR 17 in 2015. That number skyrocketed to nearly a thousand per year in 2017. The CHP has attributed this staggering increase to the rise of inattentive drivers on their cellphones. Cases involving debris on the roadway due to motorists’ failure to secure items/loads to their vehicle/truck. Confidential settlement involving the driver of truck who was killed when his brakes failed. The driver was forced to turn his truck into an embarkment before hitting stopped traffic ahead of him at the fishhook. The driver was killed when his truck overturned after hitting the embarkment. Case settled for a confidential amount against the truck repair shop that failed to properly maintain the truck’s brakes. Six figure settlement for a Highway 17 commuter who was injured after striking computer equipment that was strewn across Highway 17. The unsecured equipment had flown out of the back of a vehicle that was taking it from Scotts Valley to San Jose. Large settlement for a case involving a four car collision on the Glenwood Drive curve portion of Highway 17. Multiple vehicles were traveling at an unsafe speed given the wet conditions during a severe storm. The injured party was struck multiple times by vehicles that were unable to stop their cars in time to avoid a collision. We work closely with a team of experts that include, accident reconstructionists, human factors experts, and traffic engineers who are well versed with the intricacies of the dangers posed to motorists traveling SR 17. There are many individuals and groups working together to push for safety upgrades on Highway 17. The “Safe on 17 Task Force” has been trying to come up with solutions for nearly two decades. The CHP has been deploying more officers on Highway 17 in recent years. The State of California has spent almost $250 million dollars in the last fifteen years on various Highway 17 improvements, including medium barriers, wider shoulders, anti-skid pavement, and flashing warning signs. We at SS&F urge all drivers traveling over Highway 17, whether you be a commuter, vacationer, or occasional user, to slow down and abide by all traffic safety rules. We believe that if everyone would stay off their phones and drive within the speed limit, the number of injuries and fatalities on Highway 17 could be dramatically reduced.